OPI recently released three (!) new collections. One of them is the Muppets Most Wanted Collection. I’m not over excited about this collection so I only picked up two out of eight. Kermit Me To Speak is the duo chrome shade of this collection: It is on the sheer side and I needed three thin coats for full opacity. Lovely shade and gorgeous shift! I topped of my accent nail with Gaining Mole-Mentum, a (rose)gold/silver shredded glitter topper. The shreds aren’t as stubborn and bumpy as I expected. I did use a top coat for a smooth finish though. These polishes look great together, don’t they?! 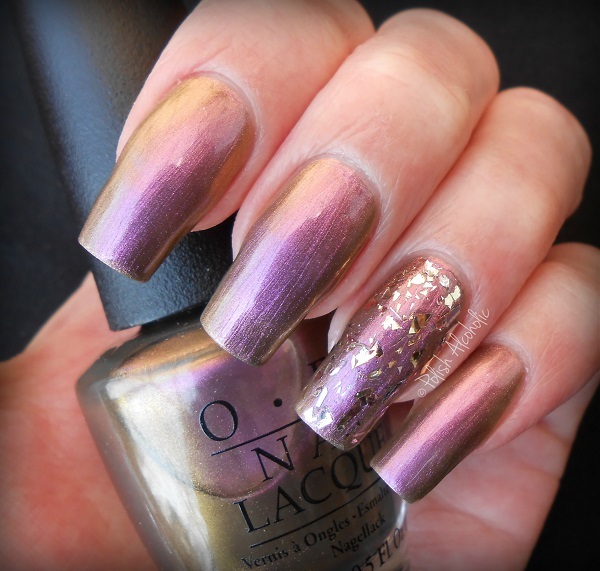 This entry was posted in OPI and tagged blog, nail polish, opi gaining mole-mentum, opi kermit me to speak, opi muppets, opi muppets most wanted, opi muppets most wanted collection, polish alcoholic, review, swatches by Polish Alcoholic. Bookmark the permalink.